Mynard, J., & Mideros, D. (2018). Introduction. Studies in Self-Access Learning Journal, 9(4), 413-414. Welcome to the December 2018 issue (Volume 9, Issue 4). We are grateful to all of the authors who submitted contributions to this issue; many will be published in the coming months. Also, we would like to take this opportunity to thank the reviewers who have given helpful feedback on submissions this year: Phil Benson, Alice Chik, Neil Curry, Anthony DiGiulio, Robert Dykes, Andy Gao, Yuri Imamura, Satoko Kato, Paul Lyddon, Diego Mideros, Garold Murray, Jo Mynard, Yoshio Nakai, Erin Okamoto, Christine O’Leary, Wareesiri Singhasiri, Raswan Sockol, Vance Stevens, Clair Taylor, Katherine Thornton, Fukuyo Tomita, Andrew Tweed, Stacey Vye, Satoko Watkins, Atsumi Yamaguchi, Kie Yamamoto Hisako, Yamashita, and Toshinori Yasuda. In the first paper, Walkyria Magno e Silva and Eduardo Castro describe a language advisor training program conducted at the Federal University of Pará in Belém, Brazil. The authors give an overview of the three-part training program and share insights that will have implications for future training programs. Responses from questionnaires revealed that the training had a positive impact on advisor trainees’ teaching and advising practices. In the second paper, Miriam Alkubaidi from King Abdulaziz University in Saudi Arabia describes a study where a comparative evaluation between the writing strategies and writing performances of Saudi Arabian EFL students was conducted. The author asserts that more frequent use of ‘before-writing’ strategies should be encouraged, but acknowledges that further research is needed regarding the relationship between writing strategies and writing performance. 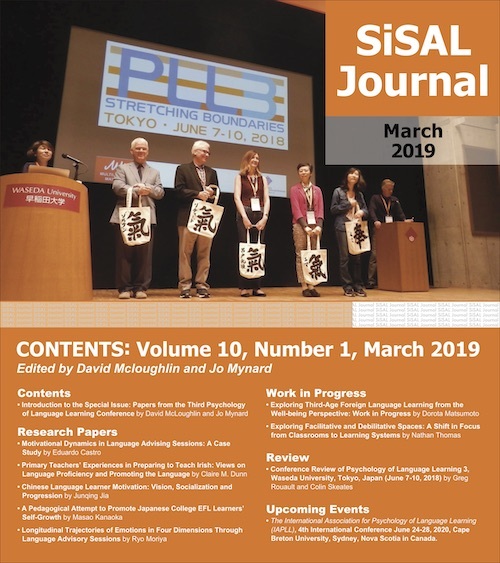 SiSAL Journal reviews are edited by Hisako Yamashita and there are two conference reviews in this issue. The first review is by Agnes Patko, Ann Flanagan, and Katherine Thornton who are all based in the Kansai region of Japan. The authors report on a student conference that took place in Kobe and provide a useful account of both the organisation of the event and the students’ reactions to presenting content related to their language learning processes in front of a real audience. Elizabeth Schlingman provides a review of the 8th biennial conference of the Independent Learning Association (ILA) which was held from September 5th-8th 2018 at Konan Women’s University in Kobe, Japan. The author provides insights related to the conference theme of ‘Whose Autonomy? Voices and Agency in Language Learning’ under the headings of ‘Who are we?’, ‘Where can autonomy be developed?’, and ‘How can we connect?’. Jo Mynard is a Professor in the English Department, Director of the Self-Access Learning Center, and Director of the Research Institute for Learner Autonomy Education at Kanda University of International Studies in Chiba, Japan. She holds an M.Phil in Applied Linguistics (Trinity College Dublin, Ireland) and an Ed.D. in TEFL (University of Exeter, UK). Her research interests include advising in language learning, the psychology of language learning, and learning beyond the classroom. Diego Mideros is a lecturer in Spanish at The University of the West Indies, St. Augustine Campus in Trinidad and Tobago. He holds a PhD in Linguistics awarded by the same university. His research interests include autonomy and agency in language learning, phenomenological research and qualitative approaches in language learning, identity and sociocultural research.